Before anyone accusses me of campaigning, this is not a political endorsement. Anyone who says otherwise really embodies the latter point. Baluktot kayo. So what’s this about anyway? I am writing about FANDOM. Sports fandom to be general about it, volleyball fandom to pinpoint it, and a certain MR.DERECHO to epitomize and defend it. Well the very word fan comes from fanatic. According to Google, a fanatic is a person with an obsessive interest in and enthusiasm for something, specially an activity. The operative word there is obsessive. The very definition of a fan is that he supports whatever he or she supports obsessively and with zeal. This is applicable in a lot of situations, political support being the flavor of the season nowadays. They have such modern terminologies as hitards, dutertards (again focus on the terms, not the politics please), leading up to the more apt term for this article, fantards. Whew, I’m tard, este, tired. In our collegiate basketball scene, the generalization that I have observed is that male fans generally watch the technical side of basketball (skills, plays, strategies), while female fans are more idol based (admiration for players, support for classmates, courtside reporters, etc.). Don’t crucify me. Just my observation. No offense meant to genders. In volleyball, specially women’s volleyball, it’s different. This time, the general obsession is to the players. The technical sports enthusiasts are fewer, simply because the popularity of the sport is much more recent than the time entrenched basketball game. It is in this environment where the FANTARDS evolved into. Ever since the Mika Reyes vs. Alyssa Valdez, Kim Fajardo vs. Gia Morado, and the Tyang Abby swag, they have evolved further. Unfortunately, the evolution seems to be reversed, going towards the neanderthal, instead of the Einstein period. Fandom became more primal than intellectual. Sorry to say but that’s not the way to go guys. If we ever want to be a regional power in women’s volleyball, and challenge teams like Thailand and Indonesia, or global Asian powers like China, Japan, and South Korea, we must evolve more towards the technical side of the sport. This means support your teams with zeal. Nobody is stopping you from that. But, it also means treat the opponents and their crowds with respect. I am telling you. The players get it. They are very good friends off the court. They respect each other’s skills on the court. And although they swag on it (La Salle being unfairly accused of in singularity), that’s brought about by the spirit of competition and emotions. NOT CONFLICT. You get it? These players will eventually represent the country and they will become team mates. When that happens, deal with it. This finally boils down to my defense of a zelous fan of ours. Mr. Derecho. I will not divulge his identity to protect him from multimedia bashing, because in truth, he doesn’t deserve it. And I will tell you why. The guy graduated from our school in the seventies, had his career, apparently retired abroad, and is a loving parent AND GRANDPARENT. The school administration knows him and he is well respected in the La Sallian community. He travels seasonally to support our basketball and volleyball teams. He saves up his money for that. And this is important. Whenever he cheers, it is NEVER derogatory to the opponents. 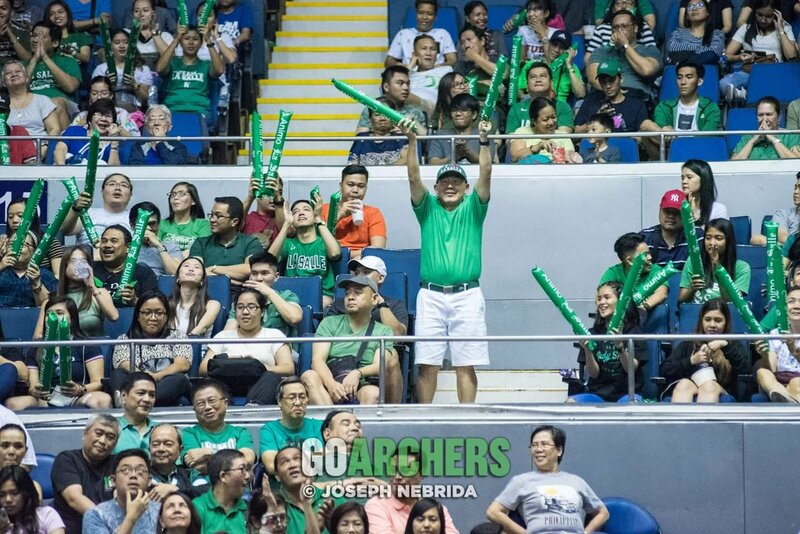 His zeal is confined to riling up the La Salle crowd to support our team. PERIOD. Hearing about him engaging some of the opponent’s fans in confrontational gestures (if ever there was any) only says that he was provoked by neanderthal fantards. I say enough of these confrontations. Contain your zeal to your communities. Focus on cheering them on. Not on confronting the other crowd. Because you’re confronting a well respected member of our community and although we are not neanderthals, we will also defend him with zeal. And really. Which would you rather pick? Baluktot o DERECHO? DERECHO LA SALLE!! !